Stephen DeSimone, president of DeSimone Consulting Engineers in New York, is engineering a new kind of skyscraper. He’s working on structures unlike anything else in the world: Supertall buildings with unusually small footprints. A huge building boom is underway along a few blocks of Midtown Manhattan. A perfect storm of economic circumstances are producing very tall buildings that are also very, very thin. And this year has felt like a race to see which outrageously pricey supertall building could sell the most expensive penthouse. DeSimone is one of just a few firms that are working to engineer these strange specimens, each the result of a complex series of negotiations involving setback laws, air rights deals, and market forces. Right now, the firm is focused on a building designed by the architect Robert A.M. Stern: 220 Central Park South. Its penthouse could become the most expensive penthouse ever sold in New York, at $175 million, while $1.1 billion-worth of condos have already been sold in the unfinished building. For DeSimone, what’s really incredible about 220 has nothing to do with the ridiculous economics of the market forces that created it. Because if you look at the footprint of the 950-foot-tall building, you’ll notice that it’s only 53 feet wide. That’s an aspect ratio of 18:1, a structural challenge that is pretty much unprecedented except along this stretch of real estate. On buildings this tall and thin, the way the wind reacts to the design of the facade is just as important as anything else about the structure. “What people don’t understand is that buildings don’t want to be aerodynamic,” says DeSimone. When most of us think of tall buildings, we imagine air flowing around sleek glass facades. But buildings that look like sails or wings have the tricky tendency to act like them too, generating lift and dangerous structural forces. On tall, thin buildings like 220, the goal is to break up the wind—catching it on nooks, crannies, and ornaments to slow it down. When you look at the neoclassical limestone facade of 220, wind tunnels aren’t the first thing that spring to mind. But that’s where this staid building began its life. “That was a process we started before we even put pen to paper,” DeSimone says. Take Frank Gehry’s IAC Building on the west side of Manhattan—a building where every single column is sloping at an angle. This novel design actually made the structure more sturdy. “We learned quickly that by sloping all these columns, you create a tremendous amount of horizontal force,” says DeSimone. Then there’s Neil Denari’s HL23, a residential tower that literally hangs over the High Line. To make that work, DeSimone’s team had to build spindly steel skeleton of cross-bracing on its face, thus cantilevering it over the park. Another of their clients, Zaha Hadid, is building a 62-story tower called 1000 Museum Tower in Miami right now. It took two years to work out the building’s structure. Originally, the sinuous metal arms that curl around its facade were purely cosmetic—the building was pretty normal, but it looked like an alien life form with an exoskeleton. DeSimone figured out a way to make that decorative exoskeleton part of the building’s structural engineering. They’re made out of hollow precast panels (produced in Dubai) that are then filled with cement when they’re installed. It actually is an exoskeleton, just Hadid’s design implied from the beginning. Even though each building is a unique, one-off anomaly, knowledge builds up. You can see this in the evolution of twisting buildings. What began with Gehry’s IAC building—where every single column is sloping—made its way into a twisting tower in Abu Dhabi called the Regent Emirates Pearl. 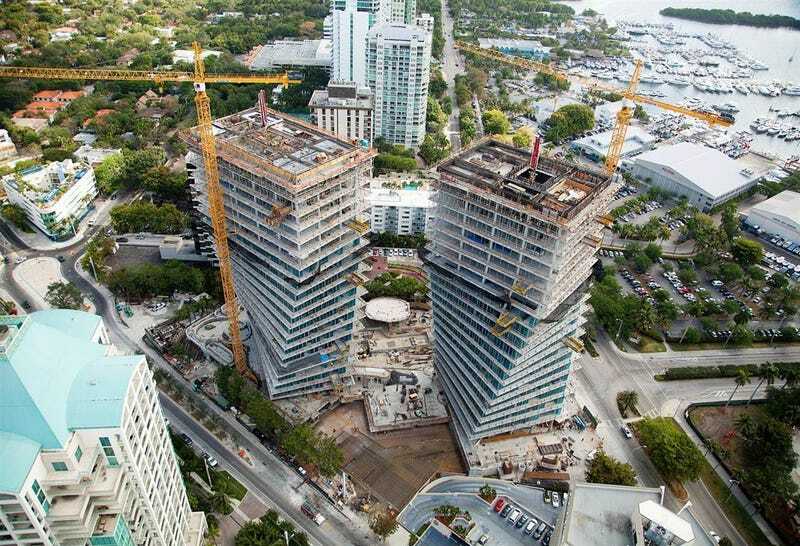 The work DeSimone did on those projects is now helping him build a pair of twisting towers in Miami designed by the Danish architect Bjarke Ingels. Each of the buildings begins as a square and then twists itself into a larger rectangle as it rises—an effect DeSimone calls “shapeshifting.” This elongation on the upper floors is for a very simple reason: Top units sell for more. Why waste space on ground-level units when everyone wants a penthouse? The twisting, meanwhile, grants each unit ideal views. It looks incredible architecturally, but it’s also a ruthless developer’s dream, and DeSimone found a way to make the deal even sharper. Most tall buildings in Miami are built with solid concrete, which takes up precious floor area in tall buildings. By building with composite steel walls, the engineers managed to reduce the thickness of those load-bearing walls by half. It was more expensive in the short term, but the extra space on each floor plan paid for the more expensive steel itself. When architects win commissions, the success of their work depends not just on their designers, but on their partners—from local firms who provide on-the-ground service in foreign cities, to the consulting engineers like DeSimone who must figure out the physics behind the architecture. It’s a relatively thankless job—after all, it’s rare that you hear the structural engineer mentioned.